I have five large maple trees that have roots above ground. I would like to build up the area around the trees and cover the roots with soil. How can I keep the soil in place and keep it from washing out into the rest of the yard? 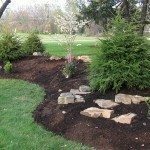 I would like to avoid a stone edging and would actually like to cover it with mulch and mow right up to the slightly bermed areas. Would landscape fabric staked down help to maintain its shape? Any ideas? You can add soil around the tree to cover maple roots and covering it with a mulch that packs tightly, like shredded hardwood will help hold the soil in place. Landscape fabric probably won't help and it will prevent your deteriorating mulch from adding to the soil beneath. You should also be aware that those roots will keep growing and popping through.